A great white shark named Katharine spent most of the holiday season swimming near the Grand Banks off the south coast of Newfoundland. Marine research group Ocearch has been monitoring the shark's location since August of 2013 with the help of a dorsal fin tracking device. 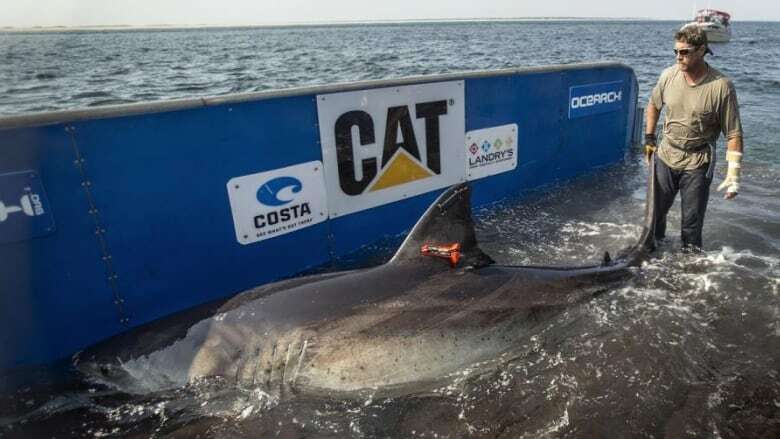 The group says Katharine weighs more than 2,300 pounds and spans 14 feet in length. This is the second time the group has tracked a great white shark near Newfoundland. Back in 2013, Lydia was tracked in Placentia Bay before making her way back to waters off the island's coast. On its Twitter page Saturday, Ocearch said Katharine's locator has been pinging near the Grand Banks for several days. She was first discovered off the coast of Cape Cod two years ago and has since travelled more than 36,000 kilometres. For more information, and to monitor Katharine's route, visit the Ocearch website.